Battlefront knows that playing a Western-front WWI game wouldn't be anything without trenches. 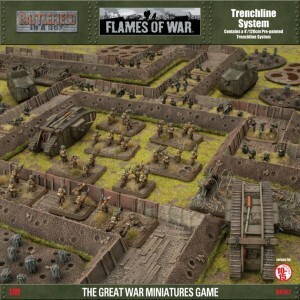 As such, they're coming out with their Trenchline System Battlefield in a Box set. Perhaps the most iconic symbol of World War I is the trench. Starting from simple slit trenches and developing into elaborate trench networks such as the Hindenburg Line, the science of entrenchment was king of the battlefield. As well as protecting the front line troops trenches link with the reserve area, allowing for reinforcements to get forward quickly and safely.